The Florida Department of Education says “high impact teachers” receive the highest valued-added model (VAM) ratings because their students ranked higher than the “reasonable expected score” of similar students in other teachers’ classrooms. Teachers’ VAM ratings are based on state assessment test scores and a mix of other variables, such as size of classes and whether students are gifted, disabled or learning the English language. Read more about the Florida’s teacher evaluation system. 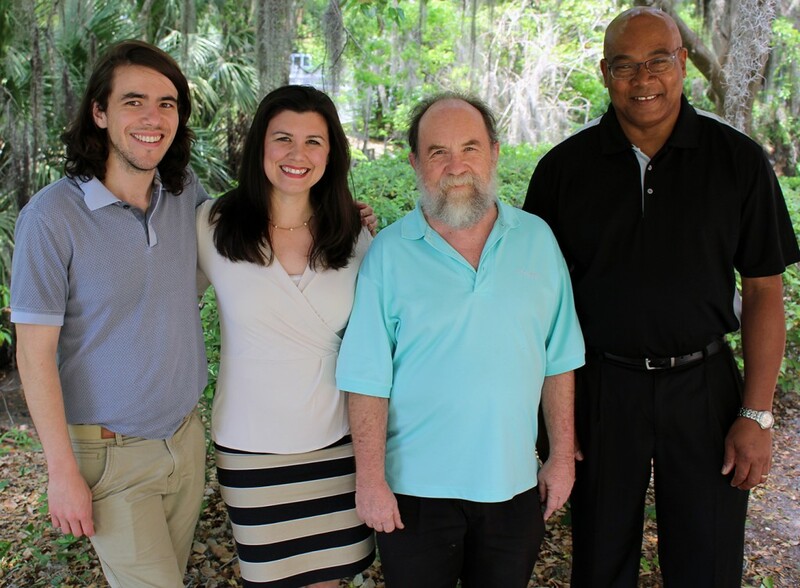 Four teachers at the University of Florida’s developmental research school are among Florida instructors rated as having the highest impact on the academic growth of their students during the past three years. The teachers at P.K. Yonge Developmental Research School are Cody Miller, a ninth-grade English teacher; George Pringle, seventh-grade math; Bill Steffens, sixth-grade math; and Kate Yurko, 10th-grade English. The Florida Department of Education recognized them as “teachers of high impact” based on a statewide ranking of Florida’s middle and high school English and mathematics instructors during the past three academic years. FDOE says less than 10 percent of eligible public school teachers receive the high-impact rating, which is derived from detailed measures and equations, called a valued-added model (VAM), and serves as a key factor schools use to evaluate the performance of teachers. In honor of National Teacher Appreciation Week, we asked these highly ranked teachers why they are succeeding. Cody Miller, at age 27 the youngest of the four, says he doesn’t “teach to the test,” a reference to the growing controversy of standardized student testing, which is among the ways the state determines teachers’ VAM rating. With the increased emphasis on tests such as the Florida Standards Assessment exam, teachers are feeling so much pressure to get students ready for the exams that they may neglect to teach skills that go beyond the tests. Miller has taught for four years, including three years at P.K. Yonge. He considers the high-impact rating as a validation to continue his teaching methods. These include setting a high bar and having students write numerous papers, complete projects, and read and critique eight books each year – ranging from Shakespeare to contemporary memoirs from authors around the world, and graphic novels. George Pringle, a seventh-grade math teacher, says he starts each school year with the mindset of improving his teaching practice. A native of Jamaica, Pringle has taught for 16 years, including eight at P.K. Yonge. “What I do for one student I do for all students. That is, I treat all students as individuals. My philosophy is for my students to show a willingness to succeed at math. Bill Steffens, a sixth-grade math teacher, is the most experienced of the four. He has taught for 36 years, including 24 years at P.K. Yonge. Yet despite his veteran status, he says each school year brings new students and new challenges to solve. Teachers should try to learn about each student and what methods best motivate them to do their best work, no matter if they are struggling learners or high achievers. It’s one of the puzzles of teaching, but there are many factors that make a teacher a success, he says. He and the other teachers say they had very little understanding of how the complicated VAM scores are determined. But Steffens says he is particularly pleased that the rating shows a consistent high level of teaching impact because it covers a three-year period. Kate Yurko, a 10th grade English teacher, says she doesn’t rely on standardized tests to gauge her success. “I’ve thought a lot about how and what I teach. If I focus on the classroom environment I don’t have to worry about the standardized testing. It’s one test on one day. After nine years of teaching, including five at P.K. Yonge, she says she has become a better teacher because she is more relaxed and better able to respond to students in real-time instead of always strictly adhering to her curriculum. And it helps having matured and not having a one-dimensional life completely centered on her classroom. Being at P.K. Yonge, where she says teacher inquiry and research are encouraged, provides a nurturing place to be creative and explore ways to improve her practice.